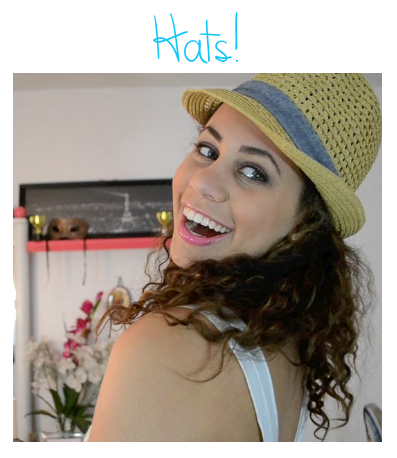 Elizzabeth Hope: Summer Fashion Essentials 2013! Hello Everyone!!! 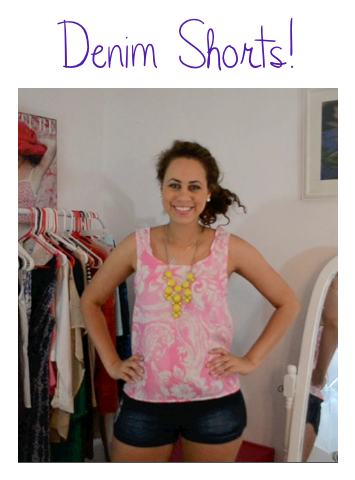 So I thought I'd do a blog about my Summer Fashion Essentials for 2013! Summer is one of my favorite seasons. It's warm, sometimes too warm, but it's also a time to change up your style. Test out the waters of different styles. Come September when everyone's back in school you'll be sporting some new looks! But it's always good to have some essentials so here are mine! 1. If there's one thing every girl should have in their closets it's a cute, flattering, flowy top. Something that's not going to stick to your body and make you sticky and sweaty. 2. 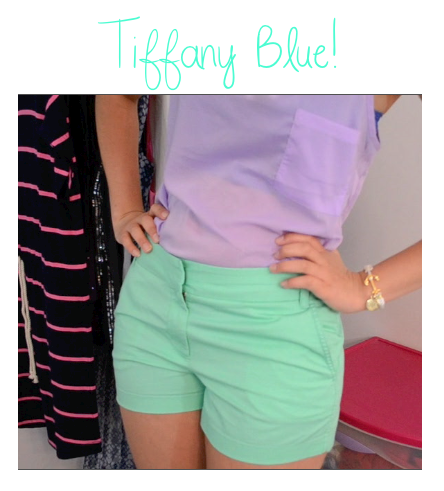 I think every girl can notice the Tiffany & Co. blue color anywhere! A new trending color I've been seeing all over the place is a must have for you closet space! 3. Bandeaus are becoming a staple piece in closets today! If you not feeling a tank top grab a bandeau to go under your sheer tops and tank tops! 4. Pastels are a great way to express color in wardrobe! They were trending last year and they are trending again this year! 5. 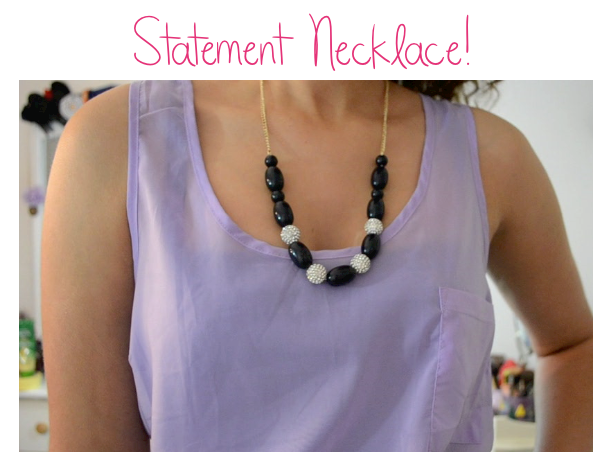 Statement Necklace's are like the icing on a cake! A standout and an easy way to make outfits go from day to night! 6. 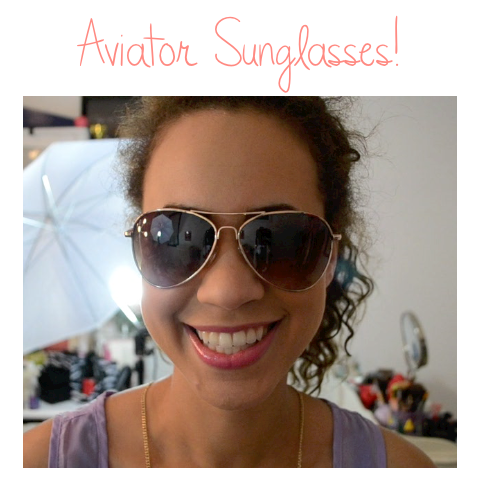 These aviator sunglasses are one of my newest favorite pair! They give your look a laid back feel to it! 7. For Cold Nights have a sweater that will keep you warm! I love this sweater because it's great for warm but chilly nights around a fire pit having s'mores! 8. 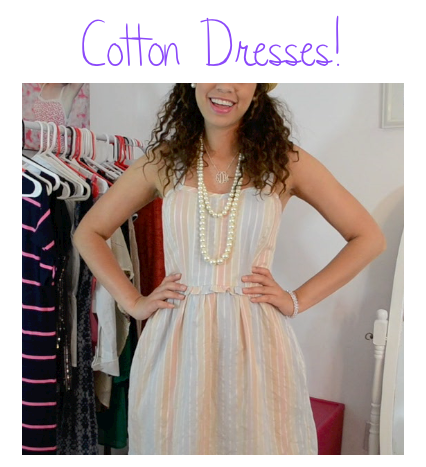 Cotton Dresses are a great way to look chic but stay cool in the summer time! The fabric isn't going to cling to you like a chiffon dress would! 9. Hats, oh hats!!! I love wearing hats! Sometimes it's harder to wear hats with curly hair because you have to pull it back but when I get the chance to I go for it! They will keep shade off your face so you won't get the rudolph red nose from the sun! 10. Detailed Tops are always a key way to making a look go from boring to spectacular! I made this shirt myself the other day from a pattern I found at Joann's fabrics. 11. Denim Shorts are always a must have for summer and even spring! Jeans are my favorite because you can dress them up or dress them down! Defiantly a summer staple! 12. Shoes...Shoes...Shoes! What would a girl do without her shoes! My summer shoes are the thong sandals! And I can't forget about my boat shoes! Gotta love them! Well those are some of my summer essentials for fashion!! Don't forget to tell me what your summer fashion essentials are for 2013!!!! Also if you didn't see it before make sure you check out my beauty essentials! HERE! I love all of your essentials! They are so perfect for summer.